The year 2018 saw many CDs commemorating the centenary of the end of the Great War. This disc is especially interesting in that it features works by composers from almost all the major combatant nations. It is also noteworthy in that the composers ranging from men who were actually in the trenches (Gurney, Dyson) to those serving in other capacities (Holst, Ravel) to Mahler, who died before the War and to George Guest, who was born during it. Pegasus has been an important chamber choir on the London musical scene for more than twenty years, almost all of that time under the direction of Mathew Altham, who, along with most of the choir-members, have “day jobs” in fields outside music (cf. my review of the Godwardine Choir). The choir is known for its wide repertoire and for the sense of experimentation in its performances. This CD dates 2015 and I don’t know why it was released only now but it is certainly appropriate for 2018. Several of the pieces on this disc, specifically the Ravel, Reger, and Rachmaninov, are part of larger compositions but serve well in their commemorative capacity. Ravel was an ambulance driver during the War and wrote the text for Trois beaux oiseaux de Paradis, one of Three Songs for Unaccompanied Mixed Choir. It is a deeply affecting work in the French choral tradition and beautifully sung by Pegasus, with especially beautiful work by the soloists. Reger’s Bachian Nachtlied evidences the sense of unease so many must have felt in late 1914, although I felt that this could have been better brought out by the choir. On the other hand, the two excerpts from Rachmaninov’s Vespers Op. 37 are beautifully sung and so authentically that it’s hard to believe we’re not hearing a Russian choir. In a clever bit of programming, Rachmaninov’s Russian text is followed by the same words in English in Holst’s Nunc Dimittis, written for Easter Sunday of 1915. Pegasus perform this is an ethereal fashion that outshines other versions I have heard but gathers strength for the Gloria. Also from across the Channel. we have the well-known Expectans expectavi of Charles Wood, a setting of words by the War Poet Charles Sorley, dead at 20 in 1915. Pegasus sings this anthem with great technical skill but not enough attention to the text. Equally well-known is the anthem For Lo, I Raise Up written in 1914 by Wood’s teacher and predecessor as Professor of Music at Cambridge, Stanford. This piece sets excerpts from the Old Testament Book of Habakkuk to describe Stanford’s horror at the coming of the War but ends with the reassurance of eventual victory and a beautiful coda that is a vision of divine peace. Pegasus certainly can cope with the strenuous nature of the first part of the anthem but really excel with the quiet coda. According to the excellent notes by Samir Savant, Ivor Gurney used to sing his 1914 setting of Psalm 23 to comfort himself in the trenches. As is well-known, he was permanently institutionalized shortly after the Armistice and wrote his motet Since I Believe in God the Father Almighty, to words by Robert Bridges, in 1925. It is a powerful and somewhat torturous work, as might be expected, but the choir handles its difficulties ably and with real attention to the text [review see] [review]. George Dyson also suffered greatly in the War but unlike Gurney went on to have a productive and prominent career. Pegasus performs his 1919 To Music in a more solemn fashion than the Godwardine Choir (see link above), but this is appropriate for the commemorative nature of this program. 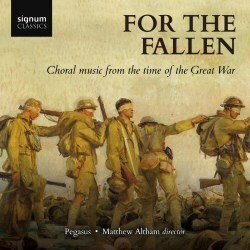 The largest work on this disc, Henry Walford Davies’ A Short Requiem was written in memory of the war dead and incorporates a variety of texts. Each section varies in style from the others, makes great use of soloists and is sung by Altham and his choir with appropriate variation and intensity, without losing sight of the overall work [review review]. The three pieces remaining might be described as “out of time” in that they are not “…from the Time of the Great War”. George Guest’s setting of Binyon’s famous words, from September 1914, itself dates from long after the end of the Second World War but is appropriately reverential. On the opposite end of the chronological scale, The Dying Soldier comes from the American Civil War but again is quite appropriate. Mahler of course died before 1914 and the advisability of arranging his Ich bin der Welt abhanden gekommen could be questioned on musical grounds, but there is no doubt that many survivors of the Great War could have identified with the feelings Mahler expressed in this song. A program that is so unified in context but so varied musically will present problems to any choir and Pegasus does have its ups and downs here on this disc. As mentioned above, the performances of the Ravel, Rachmaninov, and Walford Davies are the standouts while some of the other pieces are slightly less satisfying. The overall recording quality is also rather distant. On the plus side, Pegasus has a beautiful sound and great clarity of line. They are also ably assisted in the Wood and Stanford works by Martin Toyer at the organ, but perhaps the most important thing about this disc is that both the singing and the programming are appropriate for its purpose: as a memorial to the Great War.